A big congrats to Lesley aka Lionsmane, the Featured Stamper on Splitcoast (FS321)! What a fab gallery she has! There were many I wanted to case, and I finally chose her Pink Cat Baby Card. I kept the general layout but moved things a bit, the soft colors and embossed background. 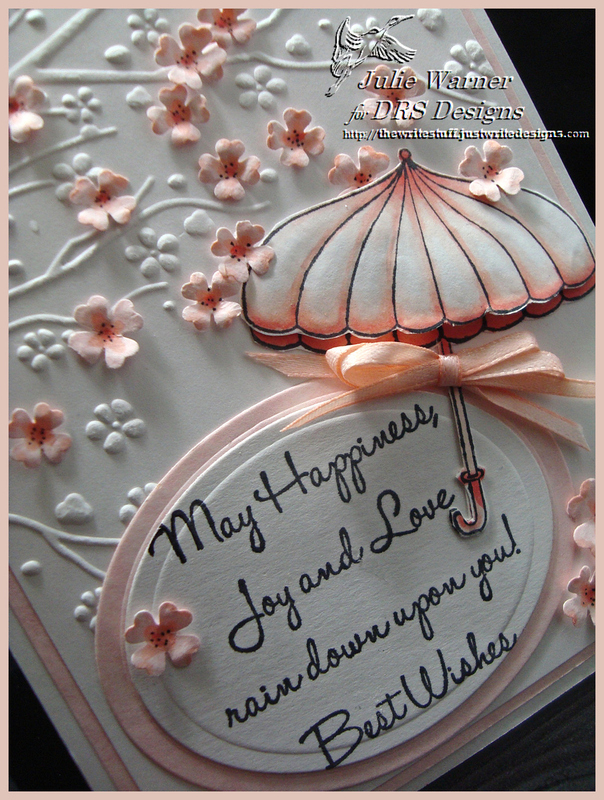 I used different images, different embossing folder and added some punched and colored flowers. The images are from DRS Designs. I stamped the lovely umbrella twice, added some soft shading w/ Copic markers and cut both out. I used a stylus to add some shape and dimension to the top umbrella and attached it on the base umbrella w/ a little foam tape underneath the center. The narrow little ribbon bow was also colored w/ Copics before attaching. The background was embossed and I punched a bunch of different sized hydrangea petals out, added a little shading and tiny black dots in the centers, then used the stylus to curl the petals a bit. 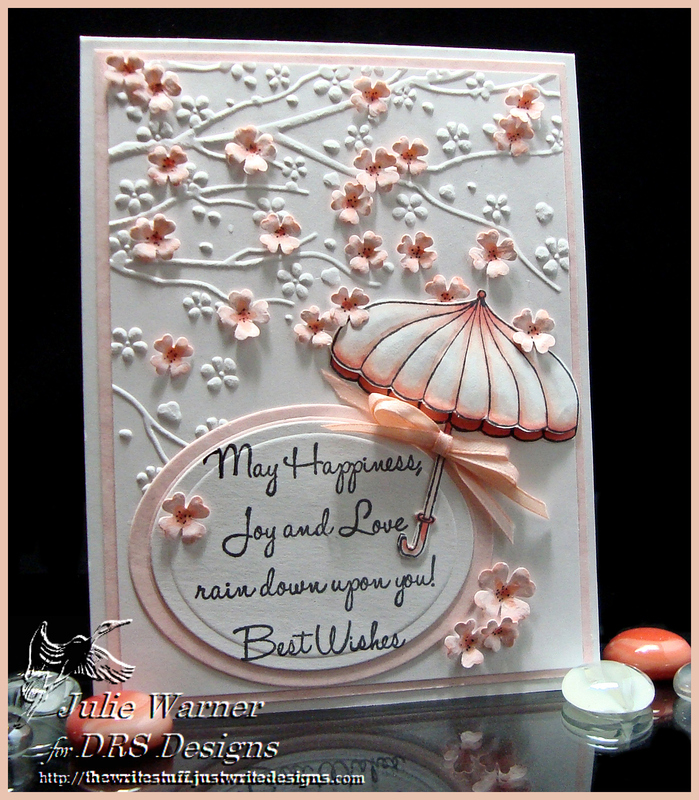 The sentiment was die cut along w/ the pale pink backing oval to finish my 4.25 x 5.50 card. Congrats again, Lesley, enjoy your week! A big congrats to Jennifer, the Featured Stamper on Splitcoast (FS320)! Her gallery is full of inspiration and I picked her Celebrate the 4th to case. I kept the layout and pinwheel (love making those! ), but I used different images, slightly different colors and used another image in place of 2 of the buttons. The images are all from DRS Designs. 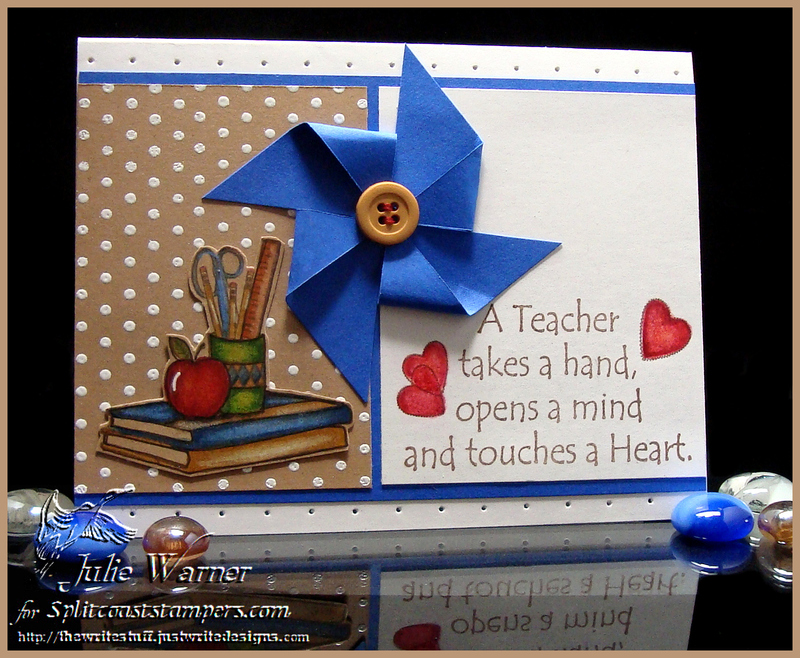 I white embossed the polka dot background on the kraft card stock and stamped the teacher tools on another piece. I colored them w/ a combination of Prismacolor pencils and Copic markers before cutting them out. The pinwheel (tutorial here) was made w/ a 2.25 square of the brilliant blue c/s and I added the piercing above and below just like Jennifer’s card. I think piercing looks great and I don’t know why I usually forget to do it. The finished card is 5.50 x 4.25. Congrats again, Jennifer, enjoy your week! Thanks so much for stopping by! Congrats to Nancy, the Featured Stamper on Splitcoast (FS319)! What a fabulous gallery! After much browsing, I chose her Inspired to Create to case. I kept the same layout, but turned it upright, used different images and different colors. The images are all from Our Daily Bread designs. I started by stamping the sentiment once w/ the pink ink then overstamping w/ the black ink. I didn’t try to get it exact..just eyeballed it. I like the light pink shadow it gives. After die cutting w/ a circle die, I backed it w/ a black die cut circle and a larger one with the crocheted background stamped in the pink ink. For the final layer, I stamped the crocheted circle the same way I did the sentiment, then die cut using the matching crocheted circle die. On the side panel, I again stamped the crocheted bg in pink then trimmed the right edge w/ scissors. For the crocheted border, I did the same as the sentiment and die cut it w/ the matching border die. I added a bow made w/ two ribbons and a mini bowdabra, some black gems and then used the black enamel accents down the border and around the circle. The finished card is 4.25 x 5.50. Congrats again, Nancy! Enjoy your week!